British expatriates Laura and Keir Locke’s perfectly sublime Mallorcan poolside party is spoiled but good when they learn that infamous ladies’ man Scott (a.k.a. Dinty) Muir is newly in residence on the island paradise. He’s the man they blame for breaking their daughter Zara’s heart and triggering her suicide. So when Muir is found floating facedown in his pool not long after the party, suspicion points to the Lockes. A lack of evidence, however, keeps sleepy-eyed police inspector Enrique Alvarez from arresting either of them. And the Lockes, of course, provide each other with alibis, however flimsy. In his 35th recorded case (An Artful Death, 2002, etc. ), Alvarez still endures the withering sarcasm of his boss, Chief Salas, and the henpecking of his sister Dolores, remaining appealingly oblivious to their barbs. 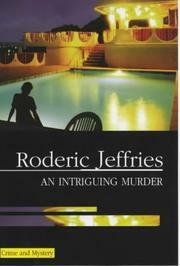 Jeffries populates the story with a vivid cast of supporting characters: blond beauty Tabitha, Muir’s date on the night he was murdered, who flirts shamelessly with Alvarez (accounting perhaps for his extra interest in the case); blowsy gossip queen Adela, who rivals Dolores as a browbeater, but ultimately can’t resist dishing dirt about others in the expatriate community; and Elena and Pablo, Muir’s servants, who frenziedly continue working even though there’s no one at Muir’s house to tell them what to do . . . or pay them. Brisk and brimming with irony, with a handsomely satisfying solution for the armchair detective.